Many of you might remember me recently talking about having to get a new wedding band because of my weight loss. I was crushed, our wedding bands were bought in England and have a LOT of emotional attachment to them (and a story behind them that some may remember). I had looked online in several places and while I could find similar ones, not the exact one. While I was digging in the fire safe box looking for my POA’s, I found the paper with the designer of the ring on it….she has a website and still sells our rings! WOOHOO!! I was so happy, I had to immediately call Bryan…now, in a month or two when I am sure my fingers have shrank their last bits, I can order a new band!! Here’s the website if anyone is interested in taking a peek at her work. My engagement ring and anniversary band are going to get resized, but we haven’t been able to find a jeweler that can cleanly resize the wedding band. 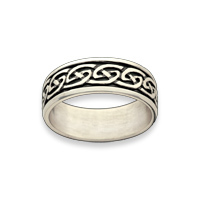 The eternal love knot pattern goes all the way around and is continuous, so anywhere it would get cut would look bad. Praise God! That totally rocks.